To tell you the truth me and sweaters do not usually get along. I have to be in a special mood to go anywhere near a chunky knit. That is stuck on a snowy mountain or in the middle of a forest, which, lets face it not my day to day environment. And yet after I have seen those beauties above I suddenly came up with a million and one reasons to wear them and where to wear them to. Indeed Bitching & Junkfood Jumpers are not your usual jumpers – no grandma patters or yucky colours. Those jumpers are creative, fashionable and will make you stand out like a peacock in the barn. Which is obviously what you want to do when its grey and miserable outside. Thank you Bitching & Junkfood for not letting wintery blues hide your creativity! 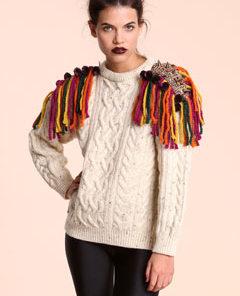 Purchase Eclectic Fringe Sweater (£150) and Fur Shoulder Aran Sweater (£110) from http://www.urbanoutfitters.com. Use discount code ‘SANTA’ to get 15% off! You are currently browsing entries tagged with knitwear at MY FASHION WISH LIST.